I'm using Windows XP SP3 to attempt to use my new HE IPv6 tunnel. I am connected to the network with Verizon DSL, and I'm using a Westell 6100 as my dsl modem (it's in bridge mode). The ip provided by my ISP is 72.92.60.81, which I have a suspicion is maybe NAT'd itself, as when I do a ShieldsUp! Scan, it returns all of my ports as Stealth. That said, I don't really know how to tell for sure that I'm behind a NAT other than the one on my router. The modem is connected to my Buffalo WZR-HP-G300NH, running DD-WRT v24-sp2 (08/07/10) std router, and it connects using PPPoE. I read various places that if you're behind a NAT that you might need to place the tunneling system on the DMZ. I also tired it with the ip address instead and it resulted in the same problem. That said, I don't really know how to tell for sure that I'm behind a NAT other than the one on my router. You're behind a NAT because the IP address on your computer is 192.168.2.110. The 72.92.60.81 is a public address being supplied by your ISP. If your ISP was running carrier grade nat (CGN) then the IP address would be one in the private range. Unfortunately placing your host in the DMZ of your router doesn't always work; there are some models that still won't pass protocol 41. The only way I know of to test this is to directly connect your computer to the Westell 6100 and see if it works then. Based on my past experience with VZ DSL, the Westell isn't doing anything funny (NAT, etc.) so it should pass the traffic you need just fine. 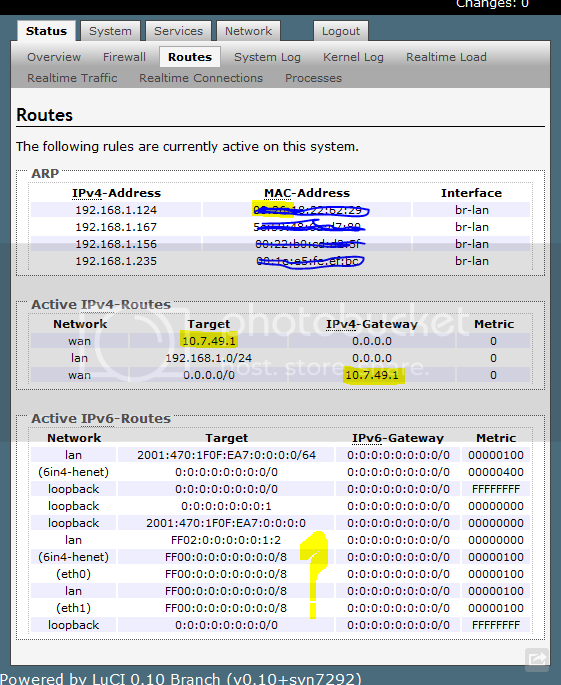 Since you're running DD-WRT on your router, why not set that up for IPv6 then use your routed /48 for your Windows host? See the tutorial at http://www.dd-wrt.com/wiki/index.php/IPv6 for directions. Ii's not the Westell 6100 series DSL modem (in bridge mode) that's the problem. It's your router. I too have VZ DSL at home and I don't have a problem. My router is a DLink DIR-615 (rev C1) and it uses 6in4 IPv6 (both directions) just fine. So I probably have to change some setting on my router? Or is it just totally incompatible? Ok so I went and changed my router firmware. It's now running Open-WRT OpenWrt Backfire 10.03.1-rc5. Using Open-WRT and a tutorial I found, I was able to get IPv6 addresses assigned from Radvd to computers on my internet network. These computers get IPv6 addresses that are within the prefix assigned to me by HE (2001:470:1F0F:EA7::/64). I added this to my configuration making the necessary changes and then followed the documentation for configuring the firewall for IPv6. I now appear to be able to ping www.v6.facebook.com from my router. You don't connect them to the tunnel. You then run radvd on the OpenWRT system to hand out router advertisements on that network. Now the internal hosts will use the OpenWRT host as their IPv6 router. So radvd needs configured then. I have radvd installed on my OpenWRT router, I don't imagine it is configured though. Both of the 'prefix' listings above I pulled from the Routed IPv6 Prefixes in my tunnel configuration. The error appears here, but it appears that the bug was a duplicate that has since been fixed. I would imagine I need to set an IPv6 compatible DNS up somewhere. But I think the larger problem that I need to solve first is what to do about those large packets that don't appear to be coming through. timeout (15.012s Validates that you can connect ot a dual-stack server (like the ds test); and that you can send/receive large packets on that conneciton. 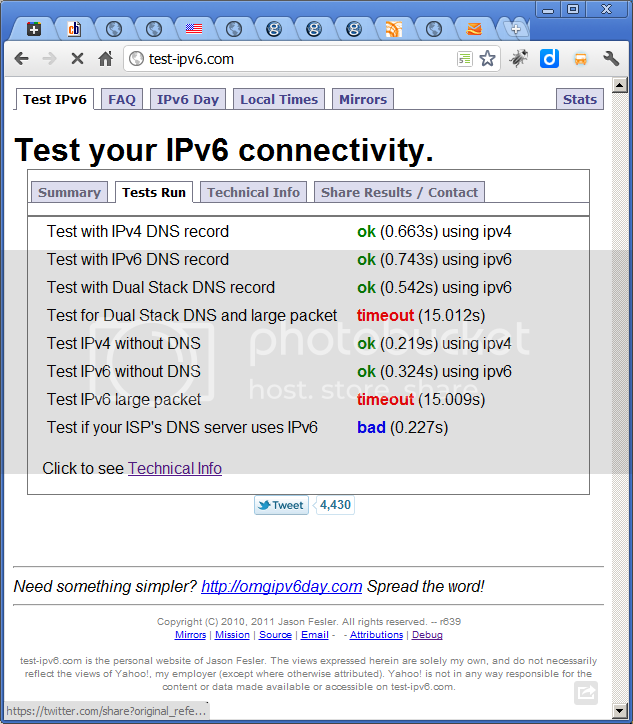 If this test times out for any reason, it indicates trouble for World IPv6 Day. Validates that IPv6 requests with large packets work. If this test times out, but other IPv6 tests work, it suggests that there may be many PMTUD issues; possibly involving IP tunnels. bad (0.227s) This is a test of your ISP's resolver (instead of a test of your host). If this test passes, your DNS server (often run my your ISP) is capable of reaching IPv6 DNS authoritative servers on the Internet. This is not critical (at this time) for you to reach sites via IPv6..
Not sure how to fix the issue with the large packets. Also a little concerned about my security at this point...I have the firewall turned on, on my Windows 7 box, but I don't know what tool is the equivalent of good old fashion ShieldsUp! other than something like nmap, but I imagine I'd have to leave my house to try that. But now I have no IPv6 internet access on my Windows 7 box. That's odd because I thought radvd dolled one out before.